Samford University’s Office of Diversity and Cultural Initiatives has planned several events in November to celebrate Native American Heritage Month. 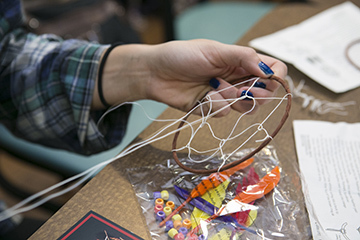 The campus community is invited to a “Create Your Own Dream Catcher” workshop Nov. 10 9:30–11 a.m. in Harry’s Coffeehouse in the Beeson University Center. Students can create a dream catcher while learning about the Native American cultural history of that art form. Native American cuisine will be featured in Samford’s main dining hall during lunch on Nov. 10. A panel discussion Nov. 16 will focus on how environmental changes affect Native Americans and their tribal lands. The 5–6 p.m. event will be in Harry’s Coffeehouse. Convo credit will be available for Samford students. The final event of the month will be a lunch and learn Nov. 17 featuring Carolyn White, elder of the Poarch Creek Indian Tribe. She will discuss the history of the Poarch Creek tribe. The event is 11:30 a.m.–12:45 p.m. in the Howard Room of Beeson University Center. The luncheon is free, but advance reservations are requested.